Announcing! 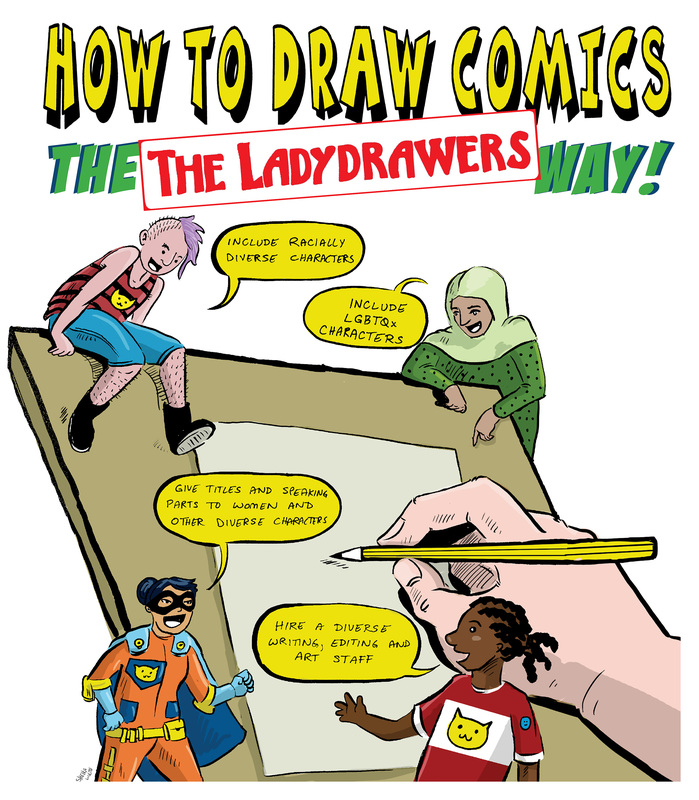 How To Draw Comics The Ladydrawers Way is now available for a special pre-order price here! You will also be able to pick it up at our June 4 event at Women & Children First, or June 6 & 7 at CAKE! *Just kidding! We only guarantee cat jokes. They’re in. Randy purple on clear vinyl, drawn by Delia Jean. Free with purchase of a shirt, book, or other stickers. 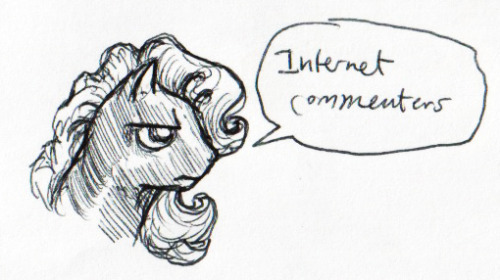 Otherwise, you have to hang out with us to get one. That’s life in the sticker game. That’s right, someone made the mistake of giving us a grant, and we’ve been working with the awesome folks over at VG Kids to turn half those dollars into SERIOUS STUFF (details TK) and the other half into PURE SILLINESS (see below). 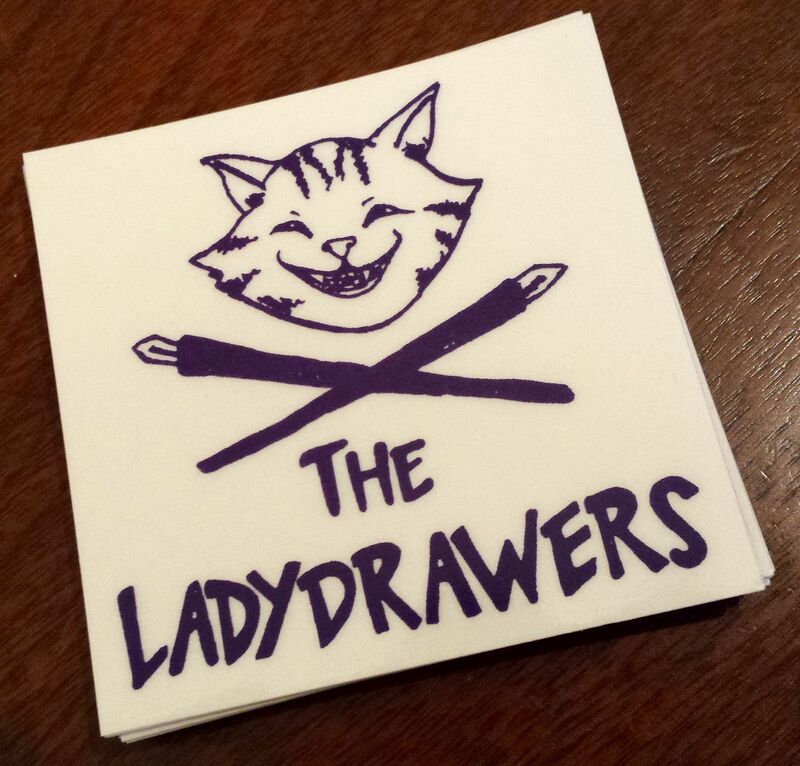 The latest merch is a 3″ x 3″ clear vinyl sticker with a skull and crossbones tabby with ink pens*. 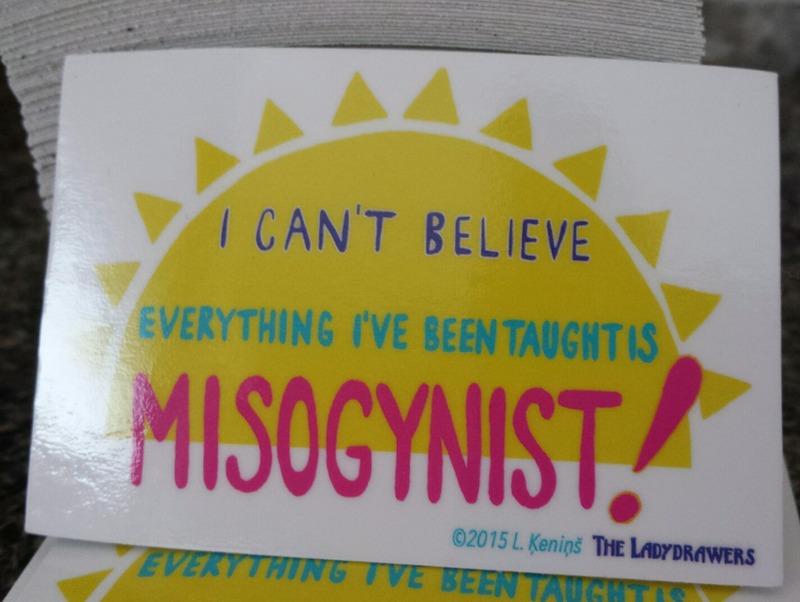 Unfortunately, in order to receive it, you will have to designate CAT STICKER when you order your book or T. Otherwise you might get a MISOGYNY STICKER and no one wants to accidentally receive reminders about misogyny!!! We already know about it!!! These stickers will only be available with another item or at one of the bazillions of events we will be at this spring and summer, details TK, like we said above, we swear, we’ve just got a lot of stuff on our plate right now. *Recent reports from medical examiners seem to indicate that tabbies, for whatever reason, are the most likely of all domestic felines to begin chowing on you after your death. 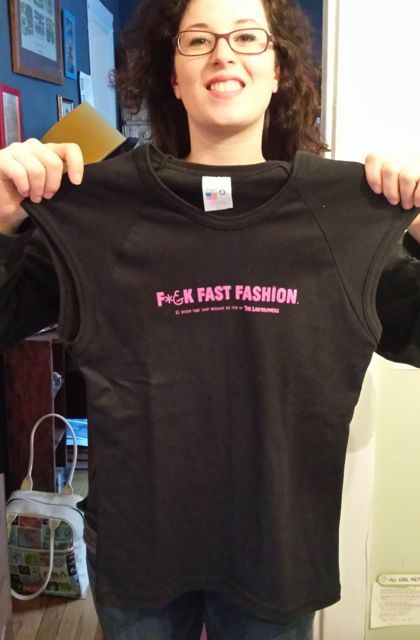 F*&K FAST FASHION Ts are Here! emblazoned across an area slightly above your privates, in M or L, muscle T or regular sleevey T options, FOREVER as long as you never take the shirt off or cover it up with another shirt (not recommended). Order here! 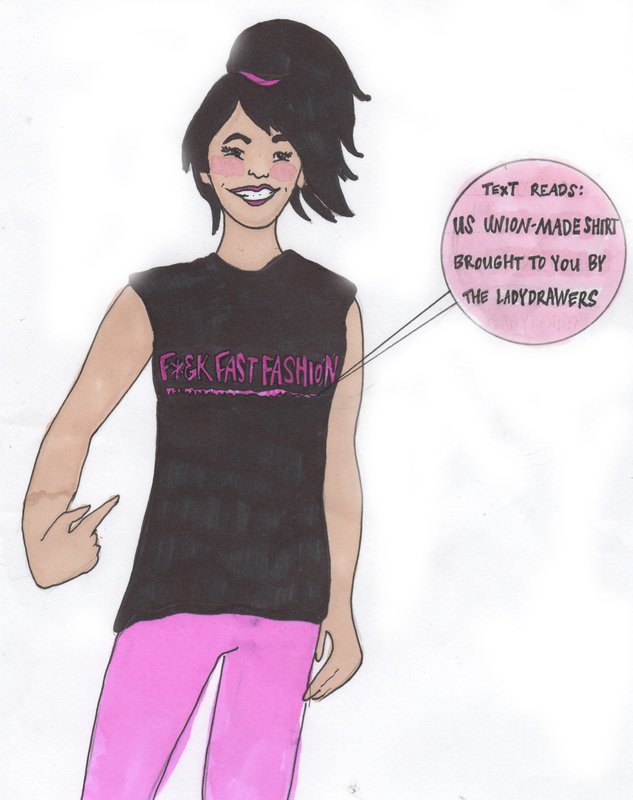 We’re also holding a giveaway on our Twitter feed now, for a Ladies L Muscle T in exchange for the best drawing tweeted to us of a cat swearing about fast fashion. 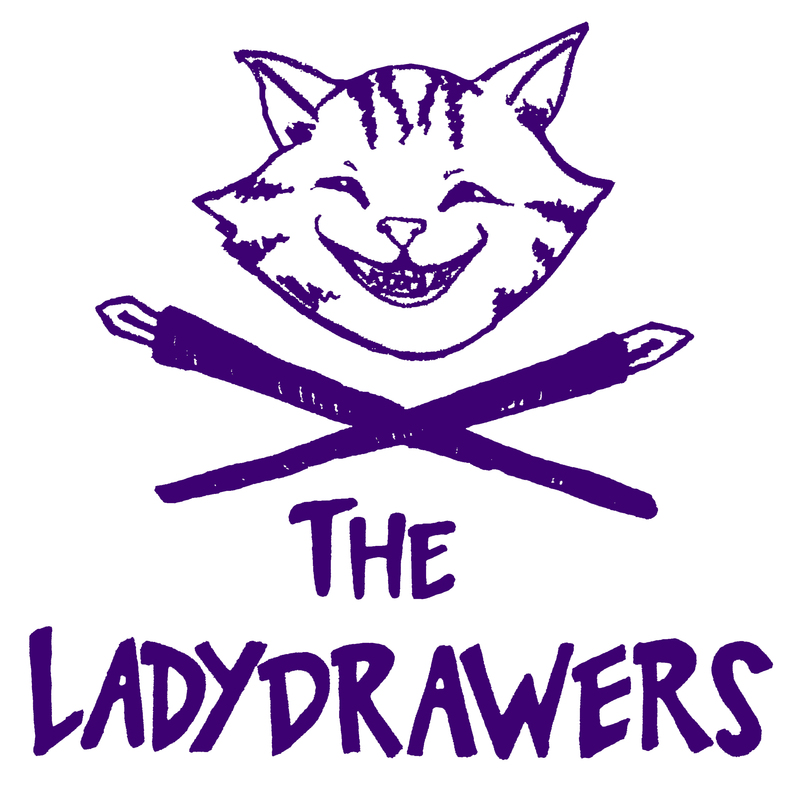 Tweet your image to @TheLadydrawers to enter! You’ve been seeming a little sad lately about all the patriarchy and stuff so we made you a present! 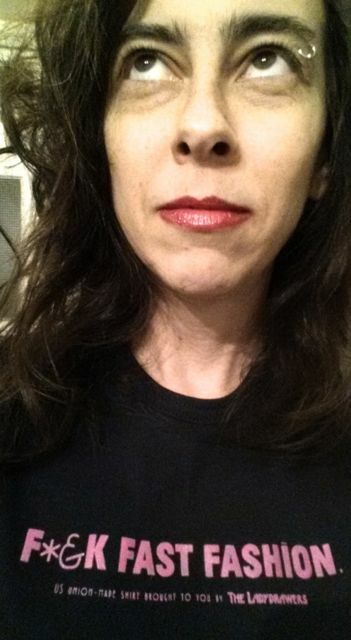 Now you can get a sticker—delightfully designed by Laura Kenins—FREE with each VOLKSMODE 2014 book or F#@K FAST FASHION T-shirt you purchase until supplies last. Or, if you are very very very excited about them, you can order a pack of five for five bucks + S&H here. YOU GUYZ. We made amazing T-shirts. They’re being printed now. 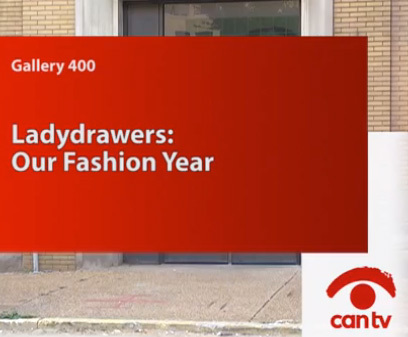 They have sort of a swear on them, and they are about the fashion industry. YES. Two sizes: Medium and Large. Two styles: Unisex Sleeved and (of course) Ladies Muscle. You can pre-order them here, or wait ’til it’s too late, all your friends already have them, and you have nothing to wear. Your call. Image by Delia Jean, obvs.